The main type of ritual in Hellenism is the sacrifice, in which material things are offered to the gods to assure their goodwill and blessings, or to thank them for the gifts they have already given us. From the earliest phases of Hellenic religion, "the bond between man and the sacred is consummated in the continuous exchange of gift for gift." Just as human social bonds are reaffirmed by gift-giving, the voluntary aid of the gods is sought through sacrifice. The goal of sacrifice, then, is to establish the bonds of friendship between gods and humans, and so encourage divine goodwill. How do Hellenes imagine the gods responding to their offerings? Since the gods are in a wholly different order of being from mortals, it is apparent that their needs are different from ours. Homer tells us that the gods enjoy ambrosia and nectar, not human food and drink. Indeed, human blood does not run in their veins, but a substance called ikhor. We may further imagine that even this anthropomorphism, which scholars tell us is so characteristic of Hellenic religion, is one of the greatest "true lies" of myth: Few moderns truly believe that Zeus is sitting in the clouds taking deep, appreciative whiffs of the roasted barley on our sacrificial fires, and many thoughtful ancient people arrived at the same conclusion. The centerpiece of Hellenic worship is an offering of food—formerly animals, now primarily grain, fruit, and other bloodless foodstuffs—and its common counterpart, libation (drink-offerings or spondai). The offering of food, some of which is normally burned, is called thusia, and is the typical form of sacrifice to the Olympians. Whatever is offered should be of the highest quality possible given our circumstances: This is our gift to the gods and expresses our esteem for them. It should be, in fact, a sacrifice: a giving of your life energy, whether in the form of time, effort, or money. Although a few organic apples might cost the same as a big bag of potato chips, the former is an appropriate offering, and the latter, most people would agree, is not. Just as you make special efforts to please guests with a pretty table with flowers and your best linens, tasty food and drink, and a comfortable, inviting atmosphere, so in sacrifice we show our hospitality to the gods, our honored guests. In addition to festival sacrifices which occur on a regular basis and on behalf of the whole community, individuals may make private offerings to the gods. One common type is a votive offering, one made as the result of a previous vow. Who has not prayed in desperation, "If you get me out of this mess, I promise I'll pay you back!" For Hellenes, such a prayer is an oath and places a sacred obligation on the one who so swears. For this reason we find monuments to military victories that consist of votive offerings of weapons—war making prayers in desperation a daily necessity—and healing sanctuaries full of thank-offerings from successfully healed patients. Today, we may promise a special ritual, a new home-shrine, a change of lifestyle, or many other things should our prayers be answered. When sacrificing to the Olympians one speaks of thusia; sacrifice to the Khthonioi is called enagisma. In animal sacrifice, the animal's throat faced upward for the Olympians and downward for the Khthonioi, so that the blood would flow directly into the ground. Altars to the Olympians, called bomoi, are set up from the ground; offerings to the Khthonioi are placed on a low altar called an eskhara or into a trench (bothros) dug in the earth. Animals offered to the Olympians--usually cows and oxen--were white; the Khthonioi received black animals associated with the earth, such as rams and pigs. Bloodless offerings of crops and especially honey are common to the Khthonioi. A drink-offering to the Khthonioi is called a khoe; the entire contents of the pitcher is spilled out onto the earth. The Olympians were honored at temples, often set on high ground; the Khthonioi in caves or underground sites. Olympian sacrifice typically happens in the morning; Khthonic in the evening or night. Ancient Hellenic worship consisted of more than just straightforward sacrifice. In fact, one of its unusual features were the agones, or contests, held in honor of the gods. These might be athletic contests, such as the famous Olympic Games, or dramatic, poetic, or musical contests. It may be difficult for modern people to imagine a sports event as a religious service—although we certainly bring enough fervor to them today!—but this notion was intrinsic to the Hellenic idea of worship. Today, sadly, our numbers are still too few to revive the agones on a grand scale, but we can integrate the idea into our worship in small ways. Instead of writing and acting full-scale dramas, we can memorize and present a single speech from one of the great dramatists at the City Dionysia. We can tell jokes instead of acting in comedies. In place of extensive torch races, young people can run a short course with a lit candle. Where there are not enough children for a chorus, individuals can sing solo or in small ensembles. Poets may offer their best efforts to the gods. In Hellenism, personal achievement, when dedicated to the glory of the Immortals, is a cause for celebration, and a celebration in itself. Burkert, p. 62: "to strew a granule of frankincense in the flames is the most widespread, simplest, and also the cheapest act of offering." Guthrie, pp. 221-222. Guthrie's entire chapter on the Khthonioi is well worth reading. My thanks to Pyrokanthos of Thiasos Olympikos for this idea. 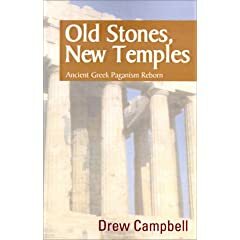 By Drew Campbell, "Old stones, new temples", Chapter 8.